***** Our trip to this year’s Edinburgh Fringe meant that the earliest show we could see Denys Edwards Players production of Mike Leigh’s classic comedic play Abigail’s Party, was the last show, but as a fan of both the play and the company that was not going to stop me being there. 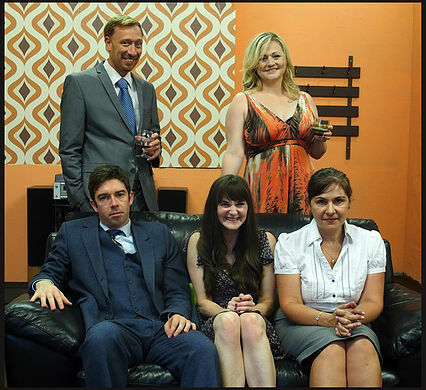 With its television adaption ranked in 2000 the 11th best television programme of all time by the BFI, Abigail’s Party is a suburban situation comedy of manners, and a satire on the aspirations and tastes of the new middle class that emerged in Britain in the 1970s. It centres on Laurence and Beverley, who are entertaining their new neighbours, Angela and Tony, as well as Susan, whose teenage daughter Abigail is having a party to which Susan has been disinvited. Over drinks and snacks goodwill clichés and fatuous small-talk abound only serve to create tension. This truly professional standard production by Denys Edwards Players would make Mike Leigh proud with the entire cast stunningly capturing their characters, relationships and tensions between them, their language, comedy and feeling of the period, supported by the fine detail of the 1970s classic lounge set, right down to the cheese and pineapple on sticks; and the direction of Ian G Walker, that brought the very best out of the cast, the set and the script, accompanied by a soundtrack that cleverly complimented, reflected and built upon the play, its expectations, passions and tensions. In a production of stand-out performances from all, the greatest performance of the night came from Leah Rhodes-Birch as the charismatic, flirtatious hostess Beverley, whose performance, both vocally and visually, and incredible stage presence, was more than a match for Alison Steadman’s performance 40 years ago, with Leigh making it her own, without at times having to say even a word, and who I could easily see performing the role in a national tour. I must also give a special mention to Marc Vestey as Tony, whose traditional good looks, attitude, charm and mood were as if he had walked on stage straight from the decade itself and deserve him a starring role in the next big 1970s television drama, and whose growing chemistry with Leah shone through making the audience more than aware of all of the characters wrong relationship decisions three years previously; and Andrew Hibbert as Laurence, who perfectly balanced controlling with being controlled and represented the prejudices of the time, as the traditional husband on the verge of extinction, with growing stress levels that lead to tragic consequences. Out of the remaining cast Ellen Hindley wonderfully captured the eager, chatty, enthusiastic Susan, naively unaware of the issues in her own young marriage, and displaying the most entertaining dance moves of the night; and Jan Ibberson who brought to life the serious, fish out of water, divorced mother of the unseen Abigail. Although it’s too late to catch Denys Edwards Players production of Abigail’s Party, though if I could go back in time I would do all I could to get this outstanding performance the sell-out audiences it deserves, I highly recommend catching this company’s next production, Last of the Duty Free, at Sheffield Library Theatre from Wednesday 21 to Saturday 24 November, as this talented company are only getting better and better every time I see them. For further information and to book visit www.denysedwardsplayers.org/current-production-2. Named after a leading local amateur actor who performed in the 1920s and 1930s, Denys Edwards Players was formed after World War Two and now perform a varied programme of three full length productions each year. For further information on the company, including a detailed history of how they were formed, visit www.denysedwardsplayers.org.